I’ve often tried to imagine what it would have been like to witness the last hours and death of Jesus firsthand. It must have been an incredible experience, whether you were a follower of Jesus, a Pharisee who hated him, or just a curious bystander. I’ve obviously read the story of the Crucifixion and Resurrection many times, but this Easter as I read the familiar verses I tried to put myself into the story. It’s hard to imagine how the disciples must have felt watching the Man they had followed for the past three years hanging on a cross. Their emotions must have ranged from the pain of watching their Friend die at the hands of the Romans, to the absolute horror of the cruelty Jesus was enduring, to the fear of wondering if they would soon join their Master on a cross. It must have seemed like their world was ending. Just one week earlier, they had marched triumphantly with Jesus into Jerusalem. They watched as the crowds gave Jesus a hero’s welcome, and they felt the pride of being on what surely felt like the winning team. But now, just one week later, they were watching their hero die as a hated criminal. Team Jesus had gone from first to worst overnight. The Gospels seem to indicate that most of the disciples watched the Crucifixion from a distance, probably out of fear of being captured and executed by the Romans. They were watching the most horrific event they could imagine, but somehow they couldn’t look away. The disciples watched as the Romans nailed Jesus’ hands and feet to the cross, and then drove that cross into the hillside at Golgotha. They saw the darkness fall across the entire city as Jesus hung there on that cross, his blood flowing down onto the ground. They felt the earthquake as Jesus commended His spirit into the hands of the Father, and watched as He took His final breath. Somehow, none of this made sense to them. Jesus had explained all of this clearly, but they were all too shortsighted to realize what was happening. All they knew was that their world was ending. Their Leader had been killed, and their team was falling apart. Darkness and death was the only thing they could see. The disciples should have known that Friday was not the end of the story. They should have remembered what Jesus told them, and looked forward to Sunday with hope and excitement. But instead, they spent Friday and Saturday in utter panic and despair. I’d like to think that if I had been there I would have been the one constantly reminding the disciples not to panic. I’d like to think that I would have been the one loudly declaring “Keep calm, Sunday is coming.” But I know how weak I am, and how much I struggle with doubt and faith. I realize that in many ways all of us act the same way the disciples did. We see only our trials, and we question why God has allowed pain in our lives. We are so focused on our trials that we miss the bigger picture. We forget that God always has a plan in everything. But Sunday is coming. It’s easy to forget that when you’re watching Jesus die a painful death. It’s easy to forget His promise that He would rise again when all you can see is the darkness falling around you, and all you can feel is the earthquake as Jesus gives up the ghost. But Sunday is coming. You may only feel the pain of your trials and the heartache you are going through. You might only see darkness, but the light is coming. You may only see a heartbreaking tragedy, but just beyond the horizon, a greater victory than we could have ever imagined is coming. It’s easy to look at the world around us and see nothing but death, suffering, and pain. Just this past week, we read the heartbreaking stories of the Coptic Christians who paid the ultimate price for their faith. Right now, it may seem that darkness is winning. The forces of evil may appear to have the upper hand. But Sunday is coming. The time is drawing near when the Lamb of God who died on that cross will return as the Lion of Judah to show His power and put an end to sin and death once and for all. Sunday is coming. Let us go forward living in the life-changing power of that incredible promise. Let us live victoriously, because our God has won the victory. 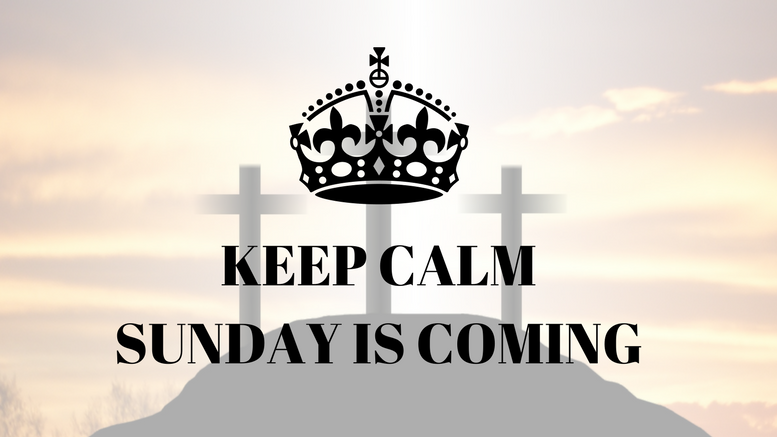 Keep calm, Sunday is coming.